I would like to extend my deepest gratitude for your tremendous generosity in providing gift certificates for three of our MCLB Barstow Marines. The families of Cpl Ramirez, Cpl Trujeque, and LCpl Mannriquez were very appreciative and were able to put the financial tokens to great use. As the wars are fading and the country begins to move on, many organizations are starting to forget our military service members and their sacrifice to this great nation. It is refreshing to see acts of generosity such as this and re-motivates me to know that there are still people out there that have not forgotten. Again, I cannot thank you enough for your generosity and thoughtfulness. I just want to let you know how much Doug and I enjoyed being a part of the Bells of Freedom program. Believe it or not, but I was so moved by the reception line of military families greeting our caravan that I started to cry. Geez, thank goodness I was wearing sun glasses. in the lives of so many families. If you need any extra help next year I would love to help, you did an amazing job! You could feel the excitement, love & appreciation in the room! It was a beautiful afternoon and we will be there next year!! You both are truly amazing and we love you guys! May the good Lord continue to bless you both for blessing all of us! Thank you so much Bells of Freedom! 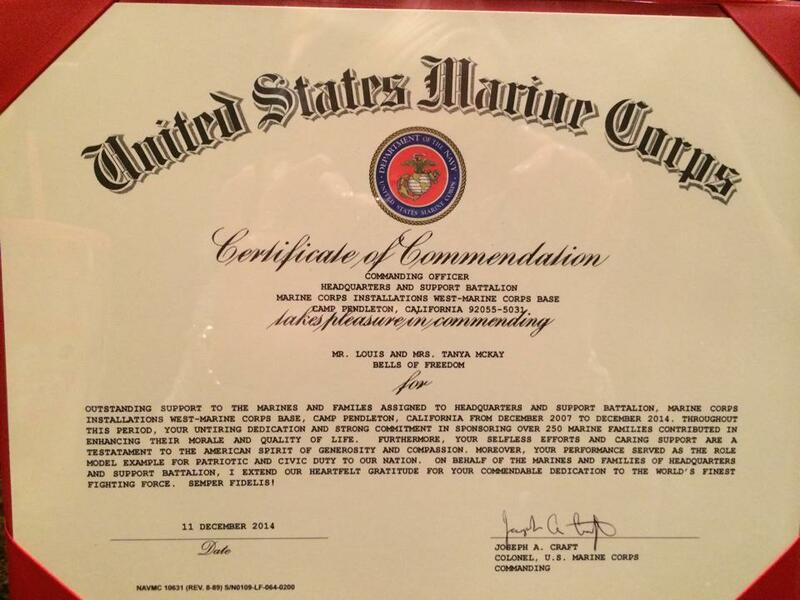 Outstanding support to the marines and families assigned to Headquarters and Support Battalion, Marine Corps Installations West-Marine Corps Base, Camp Pendleton, California from December 2007 to December 2014. Throughout this period, your untiring dedication and strong commitment in sponsoring over 250 Marine families contributed in enhancing their morale and quality of life. Furthermore, your selfless efforts and caring support are a testament to the American spirit of generosity and compassion. Moreover, your performance served as the role model example for patriotic an civic duty to our nation. On behalf of the Marines and families of Headquarters and Support Battalion, I extend our heartfelt gratitude for your commendable dedication to the world’s finest fighting force. Semper Fidelis! 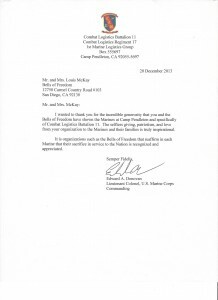 I wanted to thank you for the incredible generosity that you and the Bells of Freedom have shown the Marines at Camp Pendleton and specifically of Combat Logistics Battalion 11. The selfless giving, patriotism, and love from your organizations to the Marines and their families is truly inspirational. It is organizations such as Bells of Freedom that reaffirm in each Marine that their sacrifice in service to the Nation is recognized and appreciated. Bells of Freedom and The Big Thank You A Great Success! Thank You! event. I woke up last Friday to an email from a family I met last year. They are overseas and sent me the most beautiful picture of their family and wishing me a happy holiday also, letting me know how much they appreciated last year. This year I had the great pleasure to connect with Sgt. Leanne Zimmerman and her darling and well behaved children. I am excited that she has invited me to share their holiday after the first of the year when the children get back from visiting their father in Virginia who is also in the military serving our Country. I appreciate being part of such a wonderful organization! Thank you to you and Tanya for your warm and generous big hearts! Thank you guys again for everything! Good afternoon. I would like to say that it was a pleasure getting to meet you on Saturday at the Bells of Freedom event. Also, thank you SO much for holding the event and allowing us to be a part of it. It is really a blessing that there are wonderful people out there who appreciate everything the military does. I am so proud of my husband and all the troops who are sacrificing their lives every day for us. Good morning. My name is Sgt Felix M Baltierra III. My family was blessed with one of your sponsors and I’d like to tell you on behalf of my wife Petra and my two sons Julian and Noah thank you very much. I’ve been in the United States Marine Corps nearly 6 years and this is the first time that I’ve ever been thanked or blessed with such a gift to this level. I understand that Christmas is a hard time for all families. But even harder for military family because of the deployments and the constant change in scenery for both spouses and children of military personnel. 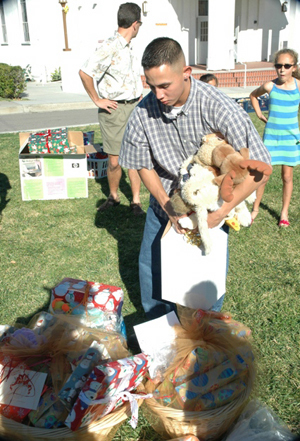 I’m glad to know that there are families out there that don’t not care to help out a service member. I myself was very touch that we reicved gifts for my children. Although they haven’t opened the gifts I can tell when we got home and put those first gifts under the tree their faces were full of smiles from ear to ear to know that they got a gift for Christmas. I know for some families even the smallest gift can put a huge dent into their budget but, everyone at Bells of Freedom you truly have blessed my family with gifts that will forever be in bedded in my heart and as well as my children. 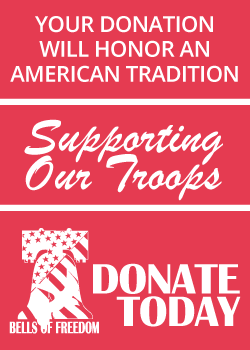 I am thankful for other Americans that give to the Armed Forces of The United States of America. And once again on behalf of The Baltierra Family thank you for everything. I want to express our thanks for all the wonderful things you and your organization have done for us this Christmas. It truly was a blessing and we are so grateful! This was a great program and we feel so blessed and fortunate to have been a part of it this year. 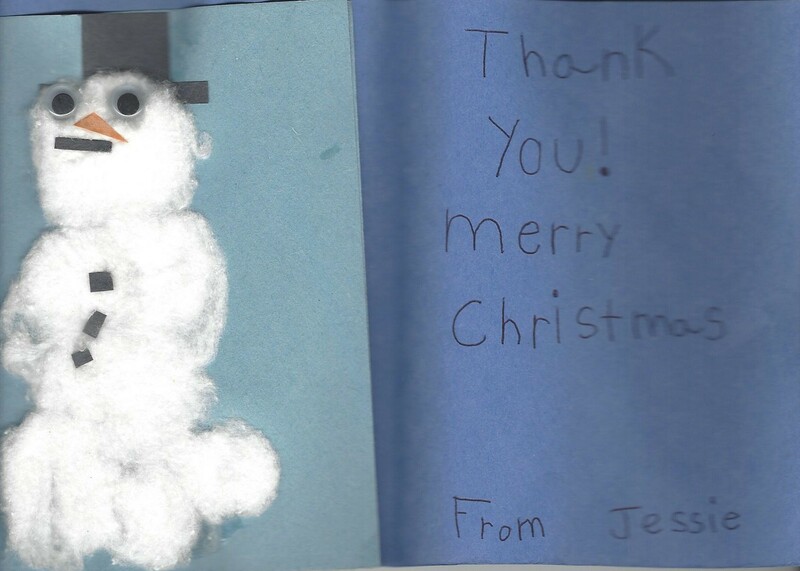 Thank you again for all the amazing generosity that you have shown us, things like this really do warm our hearts. To know that there are people who are so willing to do things like this to let us know their appreciation is just amazing! Sometimes we get so caught up in all that happens in military life that it’s nice to know that there are people out there willing to support us and help us have a better Christmas season, whether that be shown with gifts or just a kind word or support and love. Thank you for all that you do and have done to support military families. It is so appreciated!